If you enjoy playing the board game Pandemic, then you’ll be very comfortable with Quarantine, the strategic, disease-fighting simulator from Sproing. In Quarantine, you are tasked with saving the world from a deadly disease or virus, while expanding and leveling-up your team of pandemic experts. 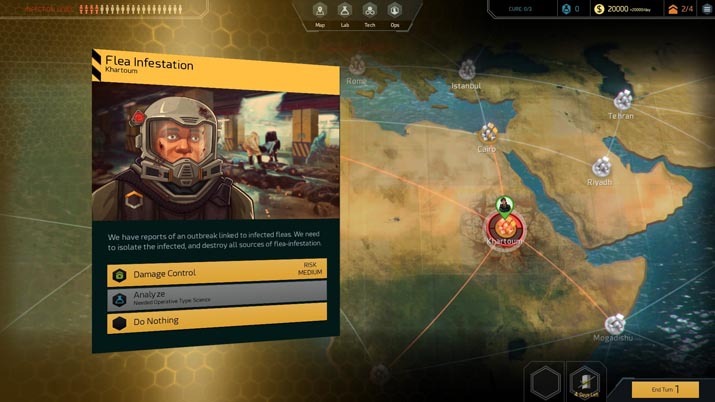 There aren’t many disease-fighting strategy games out there, so Quarantine is a fresh face to the strategy genre. However, this also means the pressure is on Quarantine to make a good first impression and really sell the doctors-without-borders flavor of strategy gaming. The gameplay itself if simple. You must stop a pandemic, either by finding a cure or wiping out the disease itself: if you've ever played Plague Inc, Quarantine is the polar opposite. You’ll spend most of your time looking at the world map, as this is where you interact with infected cities. 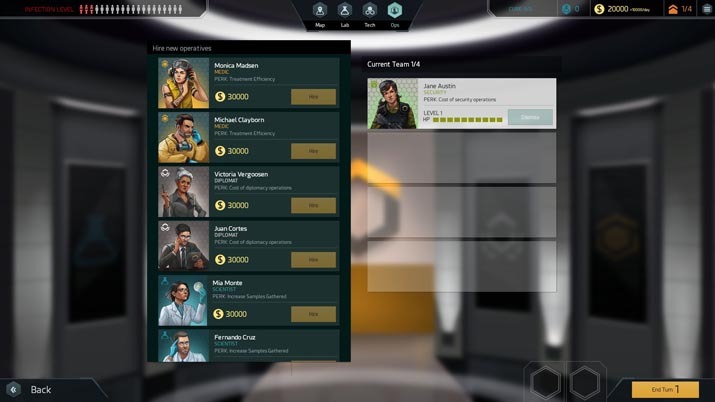 There are menus for Lab, Tech, and Ops to research a cure, unlock bonuses, and recruit a team, respectively. I played through several games on the normal and hard difficulties, and I can say with certianty that hard mode is near impossible: the pandemic is voracious, infecting neighboring cities at ridiculous rates, and your operatives become namby-pamby pushovers who succumb to injury with equally ridiculous frequency. On hard mode, I never made it past turn seven or eight. 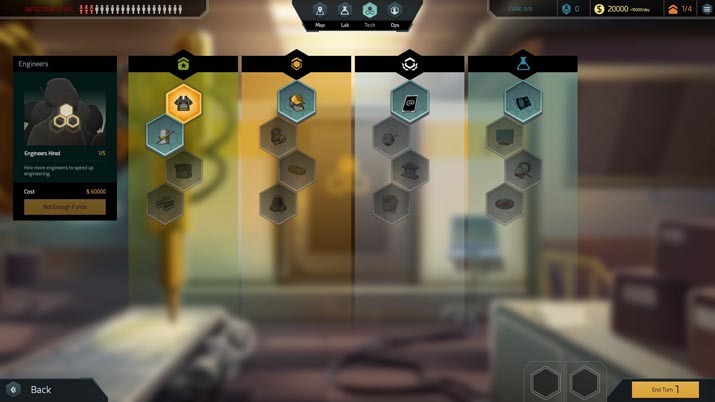 What I did learn from the pummeling, before returning to the welcoming embrace of normal mode, is that in the early game, you need a lot of money to build your team and upgrade various research labs, but once that’s done, money is no longer an issue. That said, "early" and late game is a relative term, as each campaign is extremely short. The average campaign is only thirty-five turns or so, and can be completed in twenty-five minutes, tops. Normally this wouldn't be an issue; you would just fire up a new game and jump right back in, but with Quarantine,once you play a few rounds and truly get the hang of it, you’ve pretty much seen everything. But, Quarantine is in early access, so there is plenty of room to grow and develop. Mechanically, everything works as it should. The actions you take are all based on chance and percentage. For example, healing the sickly denizens of a city or collecting deadly disease samples each have a percent to succeed. There are also events/disasters that pop up, also based on chance. It helps to have a diverse team, because these events have options that are only available if you have the proper operative. Operatives aren't always so useful, however: once a city reaches a disease level of four, you can no longer conduct operations in it. This gameplay choice was realistic and enjoyable. Since Quarantine is a strategy and simulator, the art isn’t a huge aspect, but the style is clear and clean, and it is fitting for something in the pandemic-fighting genre. The interface and all the menus are easy to view and navigate – pleasing, even. The one art choice that stood out to me, though, was the operatives: they're nearly all white. Personally, I could care less, but given that the campaign is allegedly a global effort, this lack of detail does influence the sense of immersion. Quarantine works as it should. There are no game breaking bugs, only some minor audio glitches. For example, the dialogue sometimes cuts out, leaving you staring at a silent victory screen; nothing big, but just a bug. But, all told, the current price on Quarantine ($14.99) is too high. After about forty five minutes, I'd felt like I’d seen it all: I did not feel compelled to save any more people. But, Quarantine is in the realm of early access, and I interpret this as a sign of hope. As of now, this title doesn’t do enough to distinguish itself from others in the strategy genre, but the potential is there: Quarantine could easily polish up and add more content to boost replayability, creating a much more fulfilling gaming experience. For about as long as Daniel can remember, he was a gamer. His lifestyle first started with flash games online. Next, he was playing Lego Star Wars and Ty the Tasmanian Tiger on the PlayStation 2. In his teen years Daniel moved onto the Xbox 360 with Halo Reach, Black Ops and Battlefield. Now that he has evolved into the master-race of PC gaming, he spends most of his time playing grand strategy and RPGs, but he never forgets his roots. When Daniel isn't working on his family farm in New Jersey or studying for college, you can bet he's gaming.